I have a passion for luggage and organizing bags and packing cubes and the like. Being as I am not quite the most organized person you will ever meet, that may come as a surprise. Believe me, though, I am very organized when I travel because I don’t want to drag useless stuff with me. I’m particular about what I use and how I use them. One of the biggest problems I faced in the past, since I usually do not check luggage, was fitting liquids in the 3-1-1- quart-sized bags. Just to remind you, passengers are allowed to carry liquids, aerosols, gels, creams, or pastes onboard as long as they are no larger than 3.4 ounces (3), fit in a one-quart bag (1), and are one per passenger (1). For a long time, I used a quart bag that I pulled from my kitchen supplies, pushing and shoving things in there and praying that the zip-lock would hold. Two years ago,I found a TSA-approved 3-1-1 travel bag at TJMaxx. It had a few bottles and jars in it, so I bought it. I used it to go to Italy that year, and by the time I was ready to come home, the ziplock on it had already broken. In addition, the lid on one of the jars disintegrated. I had hair wax in it, so I figure that something in the wax destroyed the lid. I taped the bag, and it went through security without breaking and spilling its contents. I threw it out as soon as I got home and resorted to stuffing the Ziploc bags again. A few months ago, I received travel bags from three different companies inviting me to try them out. Over the past two months, I’ve traveled with each one, and I can tell you that not all bags are created equal. Two of the bags did not contain bottles or jars, so I used the two silicone squeeze bottles, three jars, and spray bottle that were in the Lolly Zip kit. I used the bottles for toothpaste and body soap, the jars for a variety of creams, and the spray bottle for cologne. I also added a number of other jars and bottles to each kit (a total of 17 items) to see if they would fit without giving me a problem or splitting the bag. Lolly Zip kits contain bottles, jars, a spatula, and a funnel. In addition, customers can buy extra supplies. There are a number of silicone squeeze bottles on the market these days, but what I like about the Lolly Zip bottles are the wide-mouth openings and the smooth sides. Other silicone tubes have a “shoulder” that catches product and creates waste. In addition, the tapered design allows one to offset the tubes thus allowing you to pack more if necessary. The jars come in two sizes, and having the tiny spatula helps in putting hair wax or heavier creams in there easily. I should note that the hair wax didn’t destroy the jar’s lid. One of my favorite things about the kit is the travel bag itself. Made of a clear vinyl, the bag has a flat bottom, and the top closes with a zipper. While you might think that isn’t important, it is. I was able to fit all 17 items in the Lolly Zip bag and still have room left for other items. As you can see in the photo, I had at least another inch or two left at the top in which I could have put more items, and had I packed the tubes alternating tops and bottoms, I probably would have had even more space. The Flanabags AirQuart bag is flat with a gusseted bottom. 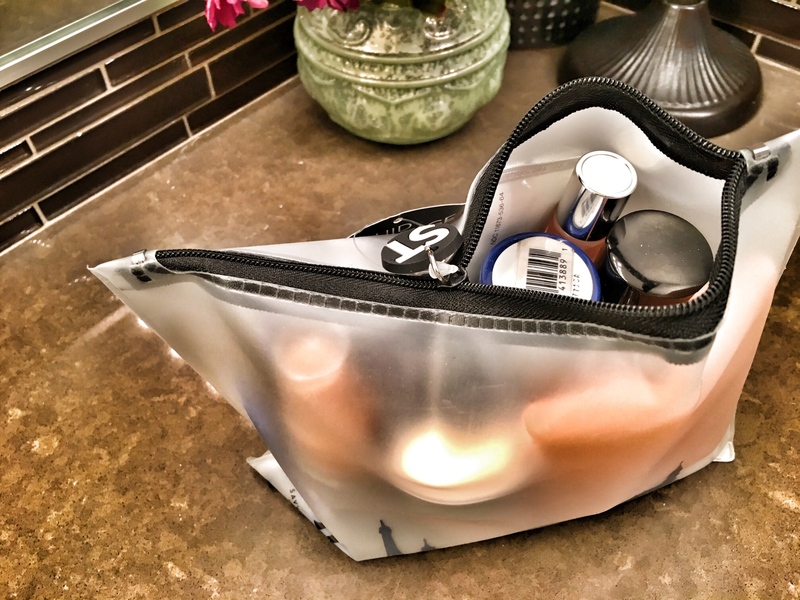 The clear bag also closes with a zipper and has an attached strap that allows you to carry it easily while going through the airport and security. Personally, I would not walk through the airport and carry the bag on my wrist, so I don’t see that as a big attraction. I did like the strong material from which it’s made, and I liked that colorful border. Because the AirQuart has a gusseted bottom, it will stand up on a counter. While I could fit all 17 items in it, they took up all of the space and stretched the sides a bit (left). Had I left out the two squeeze tubes and spray bottle, the remaining items would have fit well without stretching the bag. The third company sent a flat, quart-sized bag. Like the other two bags, this one is a heavyweight TSA-compliant bag with a zipper-close top. Because it is completely flat, it would not stand up on its own on a counter unless I removed a few things and played around with it. The worst part about the flat bag, though, is the fact that you cannot fit as many things into it. I was able to get all 17 items in the bag, but I could not close it (3-1-1 bags must be closed to go through security.). In order to get it to close, I had to remove both squeeze tubes, the spray bottle, and the drink drops. Even then, the bag stretched at its seams. The third bag was my least favorite and gets a 3-out-of-10. While I like the sturdy material and ziplock top, this plain bag would not hold much. I’ll probably use to to pack bandaids, nail clippers, emery boards, and other flat items which will not stress it. 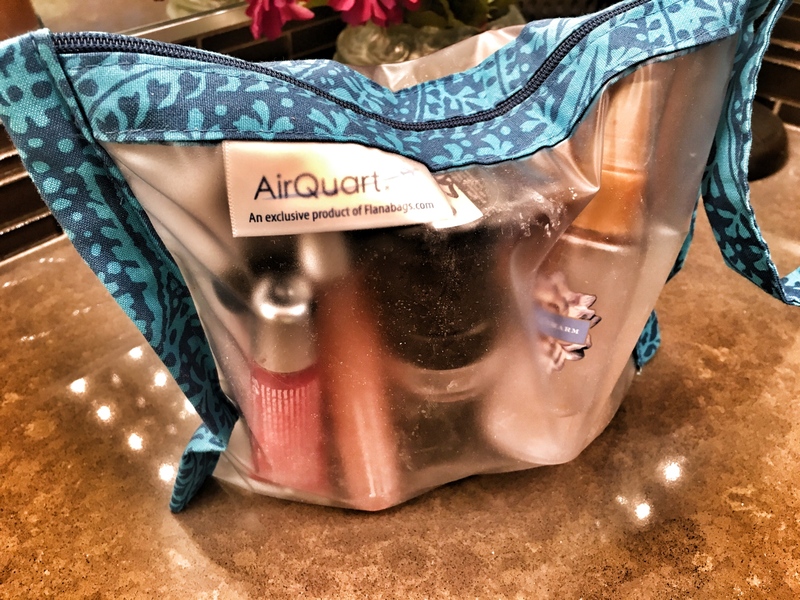 I liked the AirQuart bag, and it gets a 6 out-of-10 points. I will probably use it in the future to hold my iPod, glasses, and the cords instead of liquids or gels. The cost is about the same as the LollyZip, but it doesn’t come with jars, tubes, or bottles. Add in the expense of those items, and you’ve got one expensive travel bag. Flanabags also offers other products, and you can find them by clicking here. As you’ve probably guessed, Lolly Zip was my favorite and gets a 10-out-of-10 points. Owner Jill Dybdahl designed kits that are both functional and sturdy. 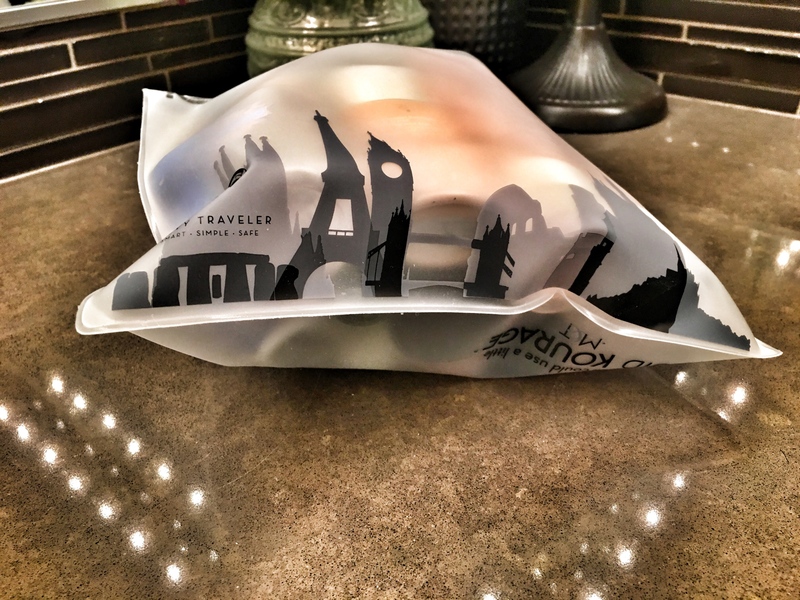 The containers are easy-to-fill, leak-proof, and reusable, and the TSA-compliant bag stands on its own and has a lot of extra space due to its design. 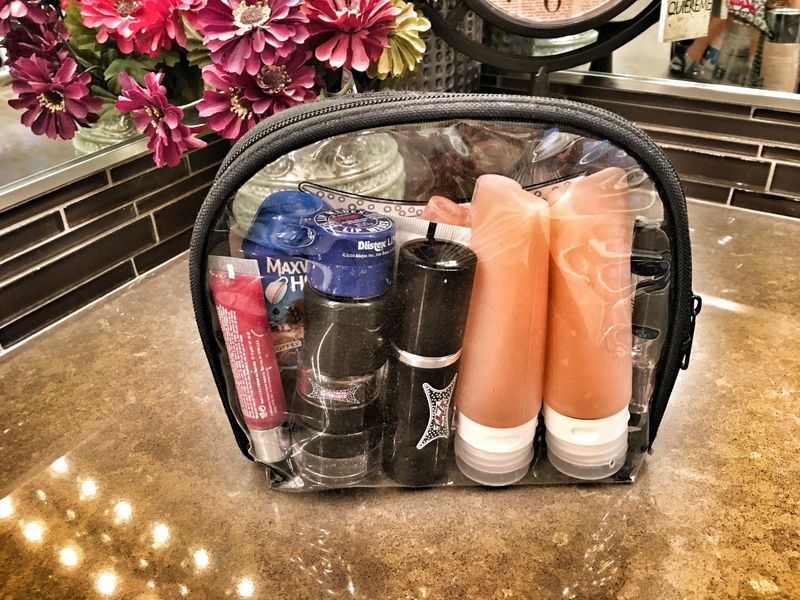 Lolly Zip offers kits for both men and women, individual bottles and jars, and a variety of other products such as waterproof electronic cases, robes, and towels. Visit their website by clicking here. If you travel a lot, you can make going through TSA and airport security calmer and a lot more easily by grabbing a Lolly Zip travel kit before you head to the airport.